Happy (almost - it's the weekend before so I am pretending) Halloween! To celebrate the upcoming weekend (fun things are happening!) 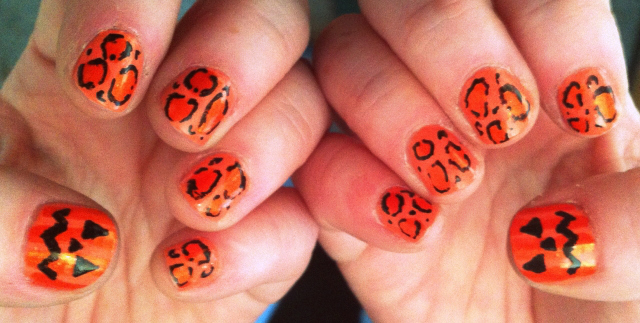 I took a wee bit of inspiration from wah nails (read loads), and did a leopard print/pumpkin manicure. I really need to get out of the leopard print rut as I seem to do it almost constantly, but it is just SO quick and easy (and I am lazy). Anyway, I changed things about a little from the original design and I really like it! I started with a base of fuzzy peach by models own. I got this colour in their pastel gift set when they were doing their massive sale earlier this year and hadn't used it yet (bit worried about the orange nail/red hair clash, I guess!). But I quite like it! It goes on a little watery at first, but two coats was enough to even the colour out. Then I used my new orange crayola polish which is amazing because it smells like oranges and is slightly shimmery and sits so nicely against the pastel orange (hint, I am giving some away over on this post). I did splodges on my nails for the leopard print effect on four nails, and did very thin stripes (using the thinner edge of the brush) on my thumb nail to create the back of the pumpkin. The stripe effect is really subtle, so you don't need to worry about being too precise, which is nice! I then took my new favourite nail art pen (a crayola one, which I am also giving away) to outline the leopard spots and create the pumpkin faces on my nails. The pen is SO easy to use so this was pretty simple (even using my left hand). If you were skipping the leopard print you could do a different pumpkin face on each finger. Fun! (I had meetings this week and attempt to pretend to be professional, so I tried to limit myself!). It's such a simple design to do, I highly recommend that you give it a go! & er, have I plugged my giveaway enough? (ha, sorry!). Have a lovely weekend, and remember to look here if you are stuck for costume ideas! See you on the other side. They look soooo cool! Yesterday I tried to do my nails with that water marbling effect but failed miserably :( boo! These look so cool! I am awful at nail art - I can't even manage polkadots or anything like that, but would really love to these a go. love these! i like them better than my own attempt haha! 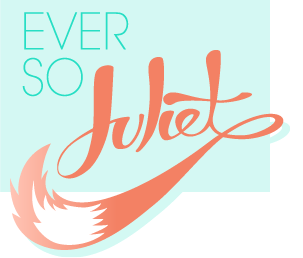 Ive just come across your blog and love it! Im hosting a nail polish giveaway over at mine if u fancy taking a peek! Those look amazing!! Also, totally going to check out that orange polish, I need one. It's probably the only color I don't own. Dainty Squid - cheers! I wasn't sure about it at first, but I really like it! Will have to try & incorporate it into non-Halloweeny manicures.